In the last edition of the Curbly Make It! library, "Make It! Secondhand Chic", I turned an old sewing table into a laptop table. Since I didn't need a laptop table, I'm now using it as a little table at the landing of my stairs. Restored Style and I were, apparently, on the same wavelength. Knock-Off Wood shows us how to make a farmhouse table, very much like the one shown above. Knock-Off's rendition is below. You know those High End/Low End photos in magazines that illustrate how you can get a high end look for a lot less? Well, these very high end, artsy coffee table designs sold by Moss could be DIY-able for much much less. Granted, original designs are unbeatable, but what if you just need a statement making coffee table? Above is a cast aluminum fruit box, by designer Andrea Salvetti, that sells for $2,695.00. The Tulip Table with a Twist! There's a whole heap of Tulip tables copies out there, but this one adds...well, a twist. "The organic contour of the Twist Stem dining table finished in an alluring yet practical black high gloss and is large enough to seat 6-8 people. The graceful curve of the table’s support is more than just a decorative feature. Beginning with a broad footprint and rising to a fine stem, it provides a firm, stable base with plenty of legroom. So, for a dining table with a twist, try this imaginative and beautifully designed piece of furniture." Ikea Hack Mashup: Enzo Mari Table that Allows Everyone to Judge Production with a Critical Eye. Ikea Hack, n. a reconstitution of Ikea product supplies or parts to create an object different in use or design. Mash Up, n. a work of art or process which recombines and modifies existing works to create a derivative but original work. Ikea Hack Mash Up, n. Awesome. 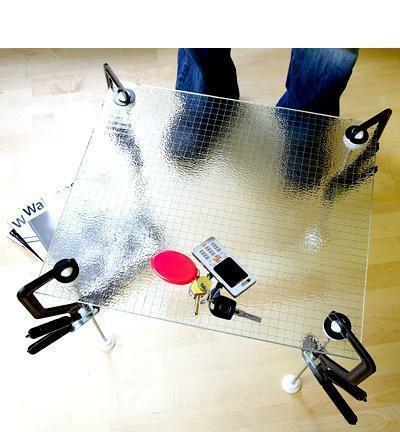 A folding table can come in very handy. This little fellow comes to us from Handy Man Wire, who says that it can be constructed out of any wood of your choosing. (Because the maker is using his table on a porch, he built it out of cedar. Stainless steel and brass hardware was chosen for the same reason.) Since you can make it in an afternoon or so, it would be the perfect weekend project. Here's your shopping list! Here's a sure way to show your buds you're both a manly man AND a crafter. Hey, I'm always game for a new way to reuse a dinged up table top. Americangypsy illustrates his crafty side in an Instructable where he turns an ordinary coffee table into a colorful, patterned beer cap pub table. Creative Department started with a rusty old tub that had been sitting out on a neighbor's porch. They gave it the squeak treatment and turned it into an illuminated table, which they call a "tubble". Instant Table: Just Add Codha Legs. Okay, Curbly-challenge time: List all the creative, unique, and ergonomic surfaces from which one could make a table... Fluorescent lighting fixture covers? Shipping pallets? Old board games? Make it happen with any and all of these with these instant Revive table legs from Codha. Read more about Codha's clever and eco-friendly work at Treehugger.